Research shows that a person who eats fruits and vegetables has noticeably youthful looks and positive disposition in life. Not only that; vegetables and fruits also contain vitamins and minerals needed by the body to maintain good health. Some of the benefits of constant consumption of fruits include lowering the risk of many kinds of diseases including stroke, high blood pressure, heart problems and cancers. It is also beneficial in weight loss as well as boosting the immune system. An early study of several universities like Ohio State University indicates that consuming dark colored fruits like grape, blueberry, and cherry can effectively prevent or slow down cancer cells. The study started with the isolation of anthocynins (juice color violet, blue and red produced by plants) and treatments made from grape juice. Pawpaw is also known as papaya, papaw, tree melon or its botanical name Carica Papaya. It is a yellow oval-shaped fruit with black seeds and sweet flesh which tastes something like mango and banana. This fruit is native in Mexico, Thailand, Africa, Central America, Australia and Asia. Proper digestion. It is rich in enzymes called chymopapain and papain which helps enhance proper digestion especially to break down the food protein into amino acids. Prevent or fight cancer. Though it is not a purple-colored fruit, it does have cancer fighter enzymes and fiber that sticks to the cancer cell and flushes them out to the system. Cure ulcer. White plant juice from unripe pawpaw contains high percentage of papain which is effective for healing chronic internal wounds or stomach ulcer and sores. Prevent colds and flu. Papaya works magically in strengthening the immune system to prevent common colds and flu. After taking medicines for flu, eating papaya or drinking its juice revitalizes the good bacteria in the intestine which had been damaged, while at the same time eliminating intestinal parasites with its antibiotic properties. 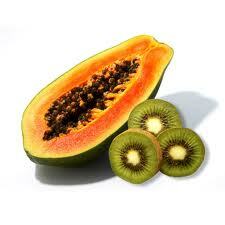 Kiwi is an exotic, hairy brown-skinned fruit with green seedy flesh and also known to prevent cancer. Among the other nutritious fruits, kiwi contains highly nutritive elements. Kiwi got its name from a bird found in New Zealand. It grows in countries like New Zealang, France, Italy, Chile, Israel, South Africa and Russia. Kiwi is richer in vitamin C than oranges and is also rich in vitamin E, natural antioxidants that prevent free radicals which cause aging. It is higher in fiber content than apple. It helps in proper digestion and as an effective natural laxative for constipation. It is also rich in potassium which is important for preventing high blood pressure. Kiwi fruit has the highest percentage of magnesium that helps prevent hypertension, myocardial infraction, and other heart diseases. Apple is one of the popular fruits and as the old saying goes: “an apple a day keeps the doctor away”. This has truth in it because of the many health benefits from apples. According to a Cornell University study, apple is a great source of boron, a mineral needed for mental alertness and to prevent Alzheimer’s disease. Apple contains malic and tartaric acid which help enhance digestion and prevent disturbances especially in liver. It contains high level of pectin or soluble fiber that helps lower blood cholesterol and loosens constipation. Apple is composed of huge varieties of vitamins and minerals which encourage blood circulation and strengthen immune system. Some fruits and vegetables are very good resource of vitamin A, while others are rich in folate especially, potassium as well as vitamin C which are both essential nutrients for the body.